The Personality Code clearly and persuasively demonstrates how personality determines why we do what we do and how we can maximize our strengths, work smarter with others, and profit from better relationships in our careers. Based on the IDISC(tm) Personality Profile-an updated and rigorously validated proprietary version of DISC, the world's most popular form of personality testing-the book provides insights and strategies for individuals and organizations that promote self-awareness and foster excellence. 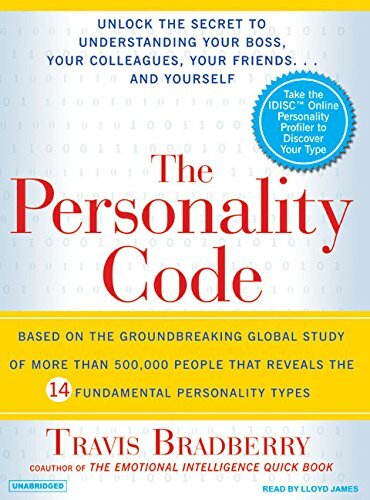 Listeners will have free access to the online IDISC(tm) Personality Profile (each book includes a unique code number), which will reveal their own profiles from among the fourteen personality types that have been refined and defined through the author's six-year international study involving more than five hundred thousand participants. Travis Bradberry shows readers how to discern the fixed characteristics that explain three-quarters of human behavior. Most important, they will learn how to leverage these traits in order to capitalize on their strengths and sidestep weaknesses in themselves as well as in other people.